The Torafuku kitchen is led by Executive Chef Clement Chan. Clement was born and raised in the city of Vancouver. 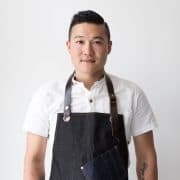 He attended culinary school at Vancouver Community College and was recognized early on as a rising star, winning provincial awards, representing Canada in the World Culinary Olympics, named National Chef of the Year and appeared on Food Network shows; Chopped Canada, Top Chef Canada and Eat St. He has worked at a number of notable restaurants in the city, including local favourites such as Hapa Izakaya, Chambar and Blue Water Cafe. These days you can find him on his award winning Le Tigre food truck or busy working at his restaurant Torafuku.